I'm often asked about how music plays a role in my writing. Although I don't listen to music as I write, music is the backdrop for nearly every word of it nonetheless. It's always there, setting the tone for where my characters are emotionally, where they've been and where they're going. In my head, once I write the scene, the music is inexorably entwined with it, like it poured from their souls into notes that I can hear. This is one example. If you've ever loved someone you knew was bad for you, someone you knew would hurt you, but you couldn't not love them, then you'll understand this. The song: Poison and Wine by The Civil Wars You can listen to it as you read by clicking the link on my sidebar. Her hand splays across my chest as she scatters kisses all over my face and neck. I feel drops of warm wetness every so often. I don’t realize they’re tears until one hits my lips and I taste the salt. She makes her way to my stomach then down my right leg and back up again, dragging her lips and tongue along the inside of my thigh. It’s not often I see the goodness in people. Or that they surprise me with compassion. Yet Marissa has. I just told her I’m a criminal and a killer, and rather than running the other direction, she cried for me. Something burns deep inside my chest. I don’t have time to think about it or deny it, or devise a plan to rid myself of it. Marissa sees to that when her lips close over me. She makes it so that she’s all I can think about. She erases all other thoughts with the first swipe of her tongue. And I’m happy to let them go. On your mark, get set, pick your pic and gooooooooooooooooooooooo! The winner was chosen this morning via Rafflecopter and BarrieMac has been notified via email. Congratulations! Is anyone else remembering the Electric Company show right now? Anyway, I'll be doing them right up until the Tuesday it releases (September 3). That one will be a doozy! But for these, I'll be posting a series of different pictures with excerpts from the book. You choose the picture you like best and share it on FB and/or Twitter (details on what to post are in the Rafflecopter on my sidebar) and voila! You're entered! But I digress. Entering is easy peasy. 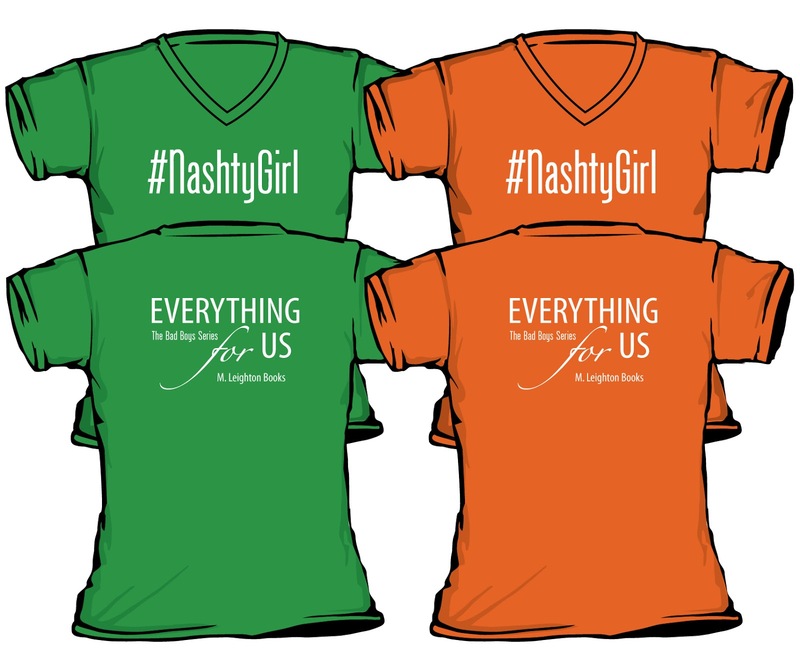 Up for grabs is a brand new, shiny and lovely ARC of Everything for Us, as well as a #NashtyGirl t-shirt in either apple or mandarin (pictured at the bottom), and a Cash shot glass. I'll draw a winner on Thursday morning (9-22) then post different pictures and start this all over again. I'll rinse and repeat on Monday, Wednesday and Friday of next week and then a different, bigger, better, stronger, faster, bionic-ER giveaway will start on Sunday, September 1st. If you don't remember all this, don't worry. I'll be doing a post about it on all of those days:) YAY! So, the first round of graphics are below. Pick your poison and get on out there! And, as always, thank you for being awesome. Okay, so tomorrow morning I leave for Las Vegas. What what! I'll be attending the Naughty Mafia book signing with a long list of super awesome writer rock stars that will make me feel all dazzled and speechless. I can't wait. It's not often I'm speechless. It goes against nature. Like white Oreos or blue grass or a cat on a leash (no, I will never, ever, ever get over that). Anyway, it's entirely possible that I will come back with scandalous pictures. If I have any to share, rest assured I WILL share them. Probably on Monday. Thennnnnn, after that, I'll be starting a little celebration for the upcoming release of Everything for Us on September 3rd. It's a giveaway bonanza! Yep, that's what I'm calling it, mainly because I've never used the word "bonanza" before and I'm very much looking forward to saying and typing it a million times over the next two weeks. All I'll tell you about it, other than it's called "bonanza" (<----see? Already loving this!) is that it will involve tasty excerpts, yummy pics, signed books and brand new swag. And I can't wait to get started! Wahooooooooooooooo! For today's tasty treat, in honor of Up to Me re-release through Berkley tomorrow AND with Everything for Us on deck next with a September 3rd release, I'm going to give away a signed copy of all THREE Bad Boys books. I don't have the final copies of Everything for Us yet, so it'll be the galley copy, but there are very few of those floating around so the winner will have something pretty rare. YAY for rare! The contest will run through next Monday (8-12) at midnight. I'll post the results here on my blog Tuesday, as well as notify the winner via email. You must be 18 or older to win and it's open internationally. The Rafflecopter is on my sidebar, but there are basically four fabulous ways to enter.